Totsy: HUGE Stride Rite Footwear Sale! My daughter wore Stride Rite Footwear when she was learning to walk. I love these shoes. 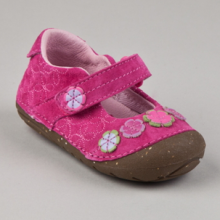 Today over at Totsy, they have an amazing sale on Stride Rite Footwear. Most of the shoes are half priced. Plus, they have a huge selection to choose from. Head over to Totsy here and check out this sale. I’m finding the daily deal sites to have some of the best deals around this holiday season. This really hasn’t been the case in years past so I think we are going to see them give the retails a run for their money! Here is a great example. Totsy is having a huge Toy Sale. You can get many great deals at already reduced prices. Right now you can save $15 on every $60 purchase with code VIPMOM at check out. You also get FREE shipping on your first order. Head over to Totsy here and sign up. It’s free and you can check out all the deals each day and compare prices before you buy! Totsy: Dora and Diego Flip Flops $5.50! I was looking at Totsy deals last night, my daughter was sitting next to me. She started yelling “Dora Dora Dora!” I hadn’t even seen Dora but somehow she did. Right now Totsy has Dora and Diego flip flops for only $5.50. They are actually really cute. We ended up ordering the Dora and Boots flips flops. She’s excited. If you are new to Totsy, head over there and check them out. They offer several new deals each day and there is usually something for the whole family! It’s also free and easy to join.